How will the candidates handle the delivery of the upcoming debates? While most of the effort will be in the content preparation, the non-verbal communication will likely become a very important factor. So what must the candidates do to ensure that their intentions match their actions? Sunday, October 9th at Washington University in St. Louis; and, the third debate on Wednesday, October 19th at the University of Nevada in Las Vegas. In the same order of the debates, the candidates will be in three different delivery modes: STANDING (lecterns), MOVING (town hall forum), and SITTING (conference table). Let’s focus on the first debate. 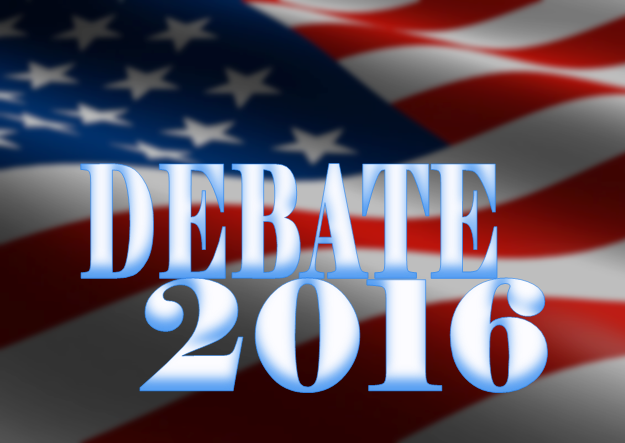 As with past setups, this debate is arranged with the candidates STANDING at lecterns, at 45-degree angles to one another, on opposite sides, with a center-seated moderator, For 2016, NBC Nightly News host Lester Holt will moderate. 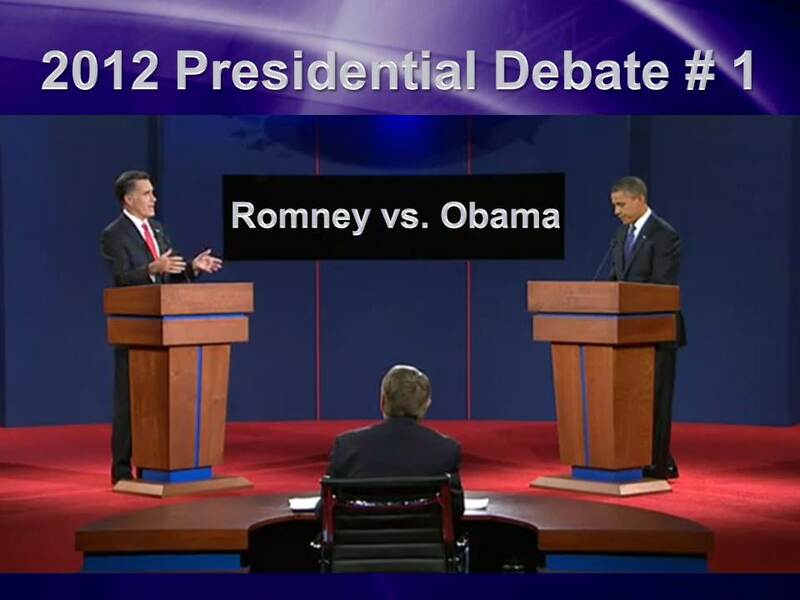 The image on the left shows how the setup looked for the first of the three presidential debates of 2012 (Romney-Obama). Regardless of words, actions will play a role based where the candidates look at any given moment. They will each have FIVE major connecting “focal” points at their disposal. 1) their opponent, 2) the moderator, 3) the live audience, 4) the camera (home audience) and, 5) any notes on the lectern. Non-verbal communication will be judged by how the candidates use these five focal points. Depending on the particular camera angle, and the depth of field of the shot (wide or close-up) the effect of the eye contact from a candidate will be either enhanced, diminished, or negligible. More importantly, the the SPLIT-SCREEN view will show the reactions of each candidate while the other is speaking. 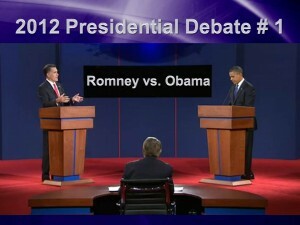 Candidates should assume that the split-screen view is always ACTIVE and the microphone is always ON! If I were coaching either candidate on non-verbal skills, I would make the following suggestions related to: the eyes, the hands, the feet, the head and the notes. When your opponent is speaking — look directly at the person as often as possible. Avoid looking into the camera or toward the moderator or into the live audience. The appearance of active listening by focusing on the person speaking is a leadership skill, while signifying an “empathetic” quality. You also have the option of looking down at the lectern, as if making notes, but don’t do this for long periods. When you are responding to the moderator or to your opponent, first look at the person who asked the question or made the comment. Then, limit that eye contact to one or two sentences before turning your attention to the camera (home audience). Always imagine that the question or comment was meant to satisfy the curiosity of the viewers, not the debate participants. Your responses are meant for the viewing audience and the camera is your best connection to the largest number viewers. Once you have made significant eye contact with those watching from home, you can also look into the live audience from time to time, but pick five friendly faces among the crowd (of the few hundred expected). These five focal points (two on your left, two on your right, one in the middle) should be your anchors to lock onto when glancing into a large group. If you have no anchors, you will see too many inputs (eyes) and you will likely be distracted when scanning the group. Moreover, with the cameras on you in close-up mode, your “darting eyes” will make you appear unsure and not in command of the topic. Body language helps create INTENTION. If you are directing a comment toward your opponent or the moderator, lift your arm and open your palm toward the person as if naturally “reaching out” in order to signify the intent to connect. The open palm is a sign of trust. If done naturally (not forced) the intention appears genuine. Both hands can be used to direct comments to the live audience and to those watching on TV (if a wider camera angle is used). Gesture to the width of the audience to include those in the room. A slight upward tilt of the wrists could signify a much larger group, such as the country or the world. When speaking, avoid gripping the sides of the lectern, and limit the number of times your hands are completely hidden from view. Try to maintain a relaxed stance (shift your weight onto one foot or the other). From side-camera angles, a shifted stance will give the appearance of energy (as if the body has the potential of motion). If your stance matches the lectern, you will appear too rigid, and your hands will end up resting on the lectern, diminishing your vocal energy. While the lectern prevents movement of the body, you can create “proximity” with the tilt of the head. The head tilts are the indicators of perspective, and can even suggest a”tone” of voice. Tilt your head slightly back to signify a “bigger picture” or a more conceptual view of an issue. Keep your head straight to convey facts and general information. Tilt your head forward, toward a person or toward the camera, to create a personal connection. To establish trust, caring, and a more personal connection — all at the same time —- combine a forward head tilt with a reaching-out gesture. While speaking, you can occasionally glance down at notes, but do this VERY BRIEFLY or else your eyes will appear closed (looking down), and your chin will drop toward your neck, muffling your vocal tones and dulling your sound. The only time you can READ anything is a direct quote or a statement of fact from a published document. It would be best to own (know) these things to appear more knowledgeable. Note-taking is helpful as long as you at least reference something that you appeared to jot down. A lead-in phrase like, “As you said earlier….” helps justify an earlier use of a note-taking action. In summary, command of the issues will be of the highest importance in judging who “wins” the debate, but the non-verbal cues (body language, vocal tones, etc.) will create a lasting impression on the minds and hearts of the viewers as to who appeared to be more presidential.